Jeannine Millan is a Registered Massage Therapist, Certified Aromatologist, and Usui Reiki Master. As a Massage Therapist, Jeannine enjoys combining her areas of expertise for personalized, holistic treatments. Her massage style is therapeutic where she will use heat packs and essential oils to reduce muscle tension and spasms. In Calgary, she focused her practice on pre and post-natal care including induction massage. Jeannine is a strong believer in the benefits of complementary health systems and in the need for individuals to share responsibility for their own well-being. She dedicates herself to this ideal by imparting skills and knowledge that will allow people to help themselves achieve healthy and fulfilling lives. She is also a dedicated teacher, having developed and presented numerous workshops for professional therapists and enthusiasts. Jeannine has introduced over 350 students to the healing benefits of Reiki, including several that have been initiated as masters. In the aromatherapy field, Jeannine has taught over 400 students the benefits of the Aroma Detox Massage Technique, a safe and practical therapy for spinal alignment and general detoxification for the body. Since 2011, Jeannine has focused on teaching Massage Therapists to incorporate the benefits of essential oils in their practice. 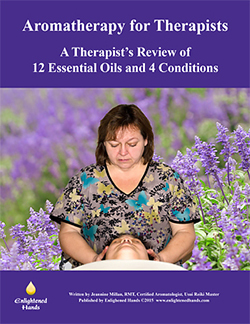 In 2015, she completed her first eBook training manual for RMTs, Aromatherapy for Therapists, to learn the basics of Aromatherapy. Jeannine has studied with Robbie Zeck, an ND from Australia, where she learned about the therapy Aromatic Kinesiology. This therapy includes muscle testing for the essential oil or oils the client needs that day. 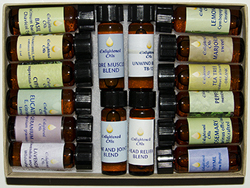 A massage blend is created personally for them where they get to take the blend home to continue using it as directed. Currently, Jeannine is working and living in High River, Alberta. View her website enlightenedhands.com for more information. Enlightened Hands offers Organic and Wildcrafted oils meaning grown wild and handcrafted blends for conditions and spiritual benefits alike. These oils are chosen from distillers that have revered established reputations for purity. There are also kits available to complement the eBooks and other classes that Enlightened Hands teaches like Spiritual Aromatherapy and Aroma Detox Massage (Raindrop). Download the 2016 Enlightened Hands Price List here. 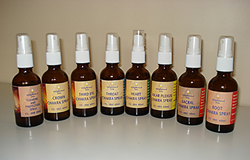 Along with the oils, Enlightened Hands offers Chakra Sprays for working with and balancing the chakra system. These are easy to use and also have dual purposes. Many are used as a body spray or personal scent and some for medicinal purposes. The sprays are in 60 ml glass amber bottles and are either made from appropriate hydrosols or combination of essential oils and distilled water. A flower essence has also been intuitively added to enhance the overall effectiveness of the spray. These are quite effective in clearing and balancing issues within the chakra system. In the Chakra Sprays kit is a clearing and protection spray that has become the most requested Enlightened Hands product by far. This distance learning class covers the basic history of essential oils and their benefits as well as cautions. We cover 12 essential oils, including which oils are safe for pregnancy. The course covers common conditions we see every day as therapists and you will learn how to use essential oils effectively for these conditions: Headaches, Sore Muscles and Lactic Acid Removal, Bone and Joint issues and Relaxation for Stress Reduction.